​In 1601 John O'Shaughnessy and Redmond Burke camped on the shores of the lake while they plundered the district. In 1678, Sir Roger O'Shaughnessy inherited from Sir Dermot all the O'Shaughnessy's Irish land - nearly 13,000 acres, and this included Gort and 2,000 acres around Lough Cutra and the lake itself. Following the revolution during which Sir Roger died of ill health, the Gort lands were seized and presented to Thomas Prendergast. This was one of the oldest families in Ireland. Sir Thomas came to Ireland on King Williams's death in 1701 and lived in Monaghan. The title to the lands was confused, but was in the process of being resolved when Sir Thomas was killed during the Spanish Wars in 1709. His widow, Lady Penelope let the lands around the lake and the Islands. On these Islands large numbers of apple, pear and cherry trees were planted, and some still survive today. The O'Shaughnessy's still tried to lay claim to the lands that had been taken from them by King William. In 1742 the government confirmed the Prendergast title, but it was not until 1753 that Roebuck O'Shaughnessy accepted a sum of money in return for giving up the claim. Following Sir Thomas's death John Prendergast Smyth inherited the Gort Estate. It was John who created the roads and planted trees, particularly around the Punchbowl where the Gort River disappears on its way to Gort and Coole. John lived next to the river bridge in Gort when in the area - this area is now known as the Convent, Bank of Ireland and Glynn's Hotel. When John died in 1797 he was succeeded by his nephew, Colonel Charles Vereker who in 1816 became Viscount Gort. The estate at this time was around 12,000 acres. 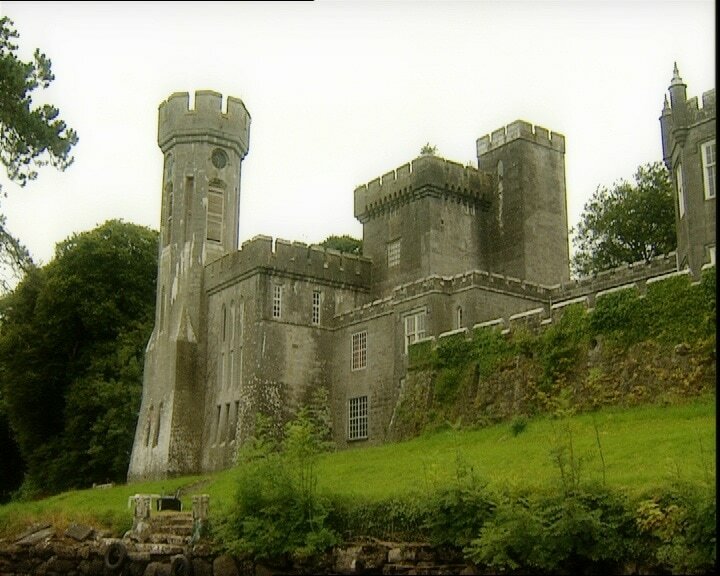 When the estate was inherited by Colonel Vereker in 1797 he decided to employ the world renowned architect John Nash to design the Gothic Style building known as Lough Cutra Castle. Colonel Vereker had visited Nash's East Cowes Castle on the Isle of Wight and was to taken with it that he commissioned the construction of a similar building on his lands on the shore of Lough Cutra. 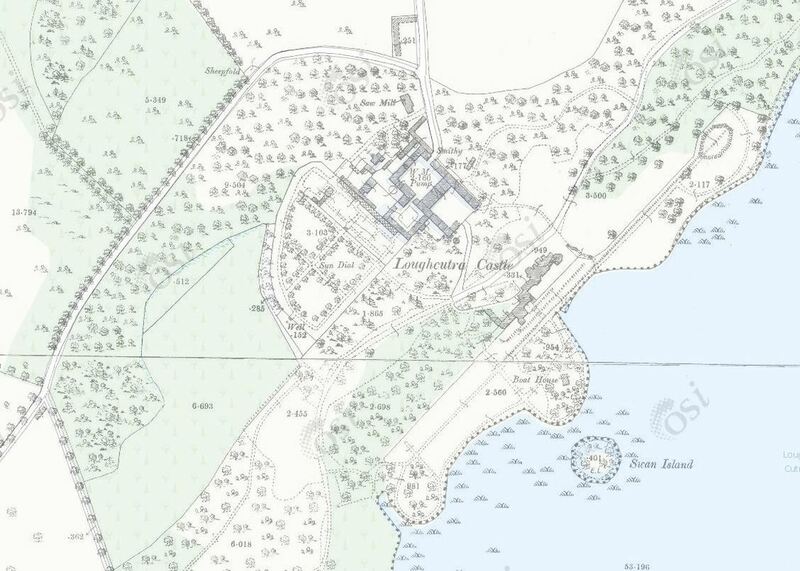 Nash also designed Mitchelstown Castle, Regents Park Crescent, his own East Cowes Castle, as well as being involved in the construction of Buckingham Palace. The Castle itself was built during the Gothic revival period and is idyllically situated overlooking the Estate's 1000 acre lake. The building of the castle was overseen by the Pain brothers who later designed and built the Gate House at Dromoland. The original building included 25 basement rooms and the cost of the building was estimated at 80,000 pounds. While the exact dates of construction are not known the building commenced around 1809 and went on for a number of years. We know that it had nearly been finished by 1817. The Viscount Gort was forced to sell the Castle and Estate in the Late 1840s having bankrupted himself as a result of creating famine relief. The Estate was purchased by General Sir William Gough an eminent British General. The Gough's set about refurbishing the Castle to their own taste and undertook further construction work adding large extensions to the original building, including a clock tower and servant quarters. Great attention was paid to the planting of trees, location of the deer park, and creation of new avenues. An American garden was created to the South west of the Castle. The entire building operations were completed in 1858 and 1859. A further extension, known as the Library Wing, was built at the end of the nineteenth century to house the war spoils of General Sir William Gough by his Grandson. This was subsequently demolished in the 1950s and the cut stone taken to rebuild Bunratty Castle in County Clare. In the 1920s the family moved out of the Castle as they could not afford the running costs. Some of the stables in the Courtyards were converted into a residence for them. The Castle was effectively closed up for the next forty years, although during WWII the Irish army was billeted within the Castle and on the Estate. The Estate changed hands several times between the 1930s and the 1960s when it was purchased by descendants of the First Viscount Gort. They took on the task of refurbishing the Castle during the late 1960s. Having completed the project they too were bankrupted and were forced to sell up. At that time it was bought by the present owner's family. In more recent years there has begun another refurbishment programme to the Castle and the Estate generally. In 2003 a new roof was completed on the main body of the Castle, with some of the tower roofs also being refurbished. There has been much done also to the internal dressings of the Castle bringing the building up to a modern standard. Around the Estate there has been reconstruction and rebuilding works in the gate lodges and courtyards. There has also begun extensive works to some of the woodlands in order to try and retain the earlier character of the Estate. The castle is a popular venue for weddings, with facilities for 200 diners, and is available for self-catering rental by groups of up to 16 guests. There are also three self-catering cottages located on the grounds. This restored tower house of six storeys stands on a narrow rock outcrop above woodland at the end of a laneway off the main N18 road. 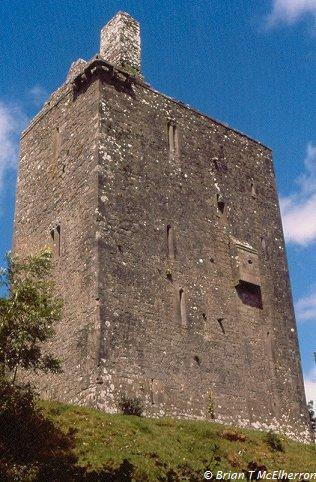 There is no date for when it was built, but in 1579 it was the cause of the deaths of Dermot O'Shaughnessy and his nephew John, who fought and killed each other in a dispute over possession of the castle. 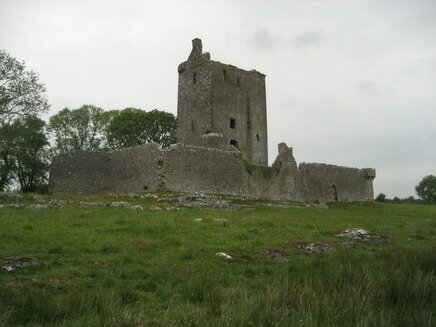 Fiddaun Castle is a tower house situated between Lough Doo and Lough Aslaun, near the village of Tubber, about five miles south west of Gort. The most notable feature of this rectangular tower house is the remarkably well preserved inner bawn wall. The tower is a six storey structure with vaulted ceilings over the first and fifth floors, and an attic on the top floor. There are square box-shaped bartizans on the northern and southern corners at third floor level. The bawn is a rectangle with a three storey gatehouse in the north western wall, and a triangular point on the south west wall. The outer wall is now mostly in ruins, but at one tie enclosed a massive twelve acres. 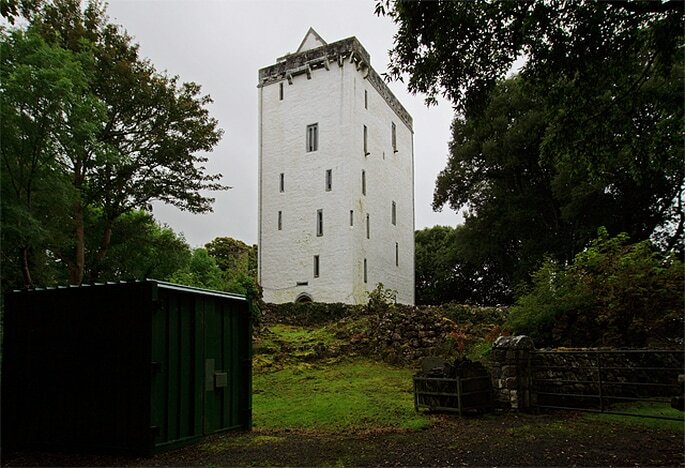 Fiddaun Castle was built around 1574, and is one of three castles in the area owned by the O'Shaughnessy family. (The other O'Shaughnessy castles were Gort Castle, Ardamullivan Castle). Fiddaun guarded the western parts of the O’Shaughnessy lands. Most of the O'Shaugnessy land was forfeited in 1697 when Sir William O'Shaughnessy, who had fought as a captain in the Jacobite cause, was forced to flee to France. The O’Shaughnessy family continued to occupy Fiddaun Castle until 1729. This former O'Shaughnessy fortress, occupied from 1574 to 1729, is a tall 6-story tower with an attic.It has a pair of box machicolations (bartizans) on the north and south corners at the third floor level.Fiddaun is a lofty tower house that is best known for having one of the best-preserved bawns in Ireland. Built during the 16th century for the O'Shaughnessys, it comprises an oblong six-storey tower with vaults over its first and fifth floors. There are square bartizans placed very low down at third-floor level, a peculiarly Irish feature that was brought about by the introduction of firearms, which changed the axis of defence from the vertical to the horizontal. Most of the O'Shaugnessy estates were forfeited in 1697 when the castle's owner, Sir William O'Shaughnessy, fled to France. Though only fifteen in 1690, he had fought as a captain in the Jacobite cause and later in exile pursued a brilliant military career, becoming a Mareschal de Camp in 1734. Fiddaul Castle was continuously inhabited by O'Shaughnessys until 1727. Located 8 km SW of Gort, off the Tubber road.